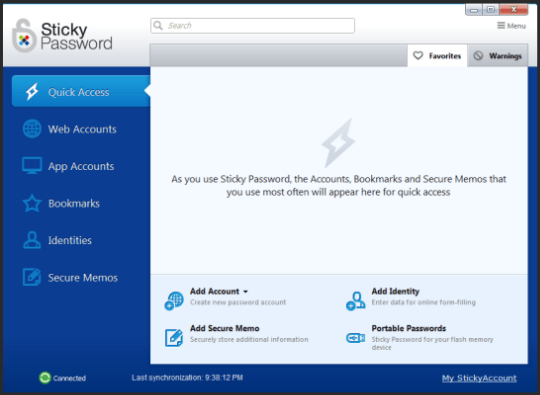 Sticky Password is a popular password manager. It stores and protects your online passwords and personal information than your browser. Although you can use your default browser to store passwords for the different website. But Storing passwords with your browser is not as secure. You need a dedicated password manager such as Sticky Password. Password managers save you the hassle of remembering logins and completing online forms. Password managers will store and remember all your logins, passwords, and identities. Sticky Password manager remembers all your usernames and passwords. It will encrypt them on your PC, then upload them to cloud (online vault) so you can use them anywhere. Sticky Password 8 is easy to use and integrates with your browsers and unobtrusive. The app stores all your passwords, synchronizes them across all devices. Install Sticky password auto-fill engine add-on/extension on your browsers. It will list your favorite sites and programs for quick access. You can use app either from your browser or Taskbar, and save all your passwords. Also, you can store credit card details, passport and driving license details. All these details are encrypted and will be unlocked only with your master password. The application will lock itself if it’s left idle for a certain time. Furthermore, the app offers secure password generator and a portable version. Protects your passwords and personal information. Synchronize passwords across all your devices (Windows, Android, iOS). Automatic form-filling saves time and hassle. 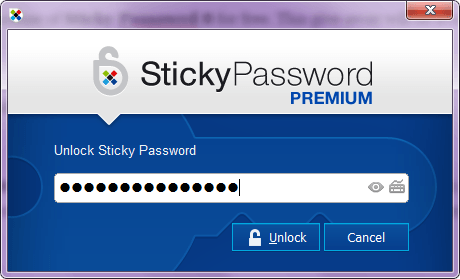 Similar to other password managers, Sticky Password is available as Paid and free version. The paid version (multi-device edition) license (One year) will cost around $20 and this version will automatically sync your passwords and personal data among all devices like Windows, iOS, and Android. Go to this giveaway page, click ‘Login’ and log in to your preexisting account or create a new account. Next, click the “get serial code” button and get the license code. UPDATE[14/06/2018]: Beta-News is running a limited time giveaway, just visit the giveaway page, hit “login” and either create a new account or login with your pre-existing account details. Finally, scroll to the bottom of the page and click “Get Serial code”. Download installer for Windows /Mac (click the links), then install it and during installation, you need to create a StickyAccount, and if you already have an account, log in with your credentials. In a similar way, for your Android device, you can download the Sticky password manager app from Google play and use your sticky account credentials ( login id & password that you created in the desktop version) to activate the app. I don’t have an iOS device, but I think the same android procedure will be applicable. Just download the iOS app from here.